7 February 2019ESA’s Gaia satellite has looked beyond our Galaxy and explored two nearby galaxies to reveal the stellar motions within them and how they will one day interact and collide with the Milky Way – with surprising results. “We needed to explore the galaxies’ motions in 3D to uncover how they have grown and evolved, and what creates and influences their features and behaviour,” says lead author Roeland van der Marel of the Space Telescope Science Institute in Baltimore, USA. 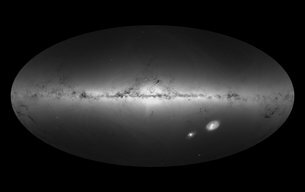 “We combed through the Gaia data to identify thousands of individual stars in both galaxies, and studied how these stars moved within their galactic homes,” adds co-author Mark Fardal, also of Space Telescope Science Institute. “It took an observatory as advanced as Gaia to finally do so,” says Roeland. 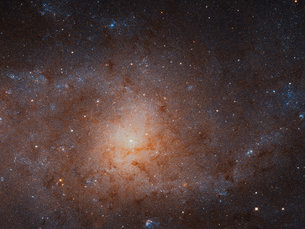 “For the first time, we’ve measured how M31 and M33 rotate on the sky. Astronomers used to see galaxies as clustered worlds that couldn’t possibly be separate ‘islands’, but we now know otherwise. 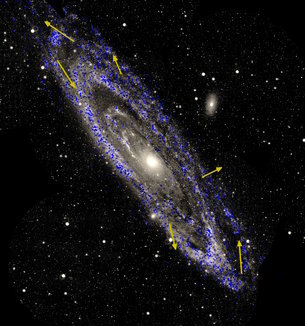 As Andromeda’s motion differs somewhat from previous estimates, the galaxy is likely to deliver more of a glancing blow to the Milky Way than a head-on collision. This will take place not in 3.9 billion years’ time, but in 4.5 billion – some 600 million years later than anticipated. “This finding is crucial to our understanding of how galaxies evolve and interact,” says Timo Prusti, ESA Gaia Project Scientist. “We see unusual features in both M31 and M33, such as warped streams and tails of gas and stars. If the galaxies haven’t come together before, these can’t have been created by the forces felt during a merger. Perhaps they formed via interactions with other galaxies, or by gas dynamics within the galaxies themselves. “First Gaia Dynamics of the Andromeda System: DR2 Proper Motions, Orbits, and Rotation of M31 and M33” by R. P. van der Marel et al. is published in Astrophysical Journal.